Kevin Krentz is a native of Atlanta, Georgia. He enjoys a varied career as performer, inventor, Artistic Director and teacher. Although he began his musical life as a cellist at 12, he soon dropped the cello to sing for the rest of his youth. He only then decided to devote energy to the cello at the age of 20 and has built a uniquely varied and exciting career as performer, inventor, teacher, entrepreneur, and arts leader. In 2000 Kevin was a winner at the Fischoff National Chamber Music Competition, with his clarinet, piano, and cello trio, In Flight 3. With Finisterra, Kevin was a winner in the 2005 Greenlake National Chamber Music Competition where they also won the Audience Prize. In 2004 Finisterra won the Silver Medal at the Zinetti International Chamber Music Competition in Verona, Italy against ensembles from every continent and 20 countries. In 2006, Finisterra was invited to perform and stay in London for extensive collaboration with the famed Florestan Trio. In addition to his chamber music credits Kevin has also won several concerto competitions and the Ladies Musical Club of Seattle Award/Tour Competition. Since 2007, Kevin has been Artistic Director of the Methow Valley Chamber Music Festival and has been Artist-In-Residence at both the Phoenix Series in New York City, NY as well as the Seasons Hall in Yakima, WA. with the Finisterra Trio. Finisterra Trio recorded all four of Hagen’s trios for the Naxos label for a recording NPR hailed as one of the top 5 albums of that 2010. In 2013, Dr. Krentz created Krentz String Works which sells his inventions worldwide. The Krentz Modulator is used in nearly every major symphony in the world for its ability to stop annoying wolf tones as well as enhancing and instrument’s tone. Other products and inventions include a technology for using electromagnetics to play-in instruments, composite bass bars for instruments that lighten their mass, an endpin that dramatically increases power and speed for cello and is also tonally adjustable and various innovations leading to the upcoming launch of a new line of cases. Kevin is a devoted teacher where he employs research he has conducted into illuminating the subjective world of string technique, helping it become objective wherever possible. 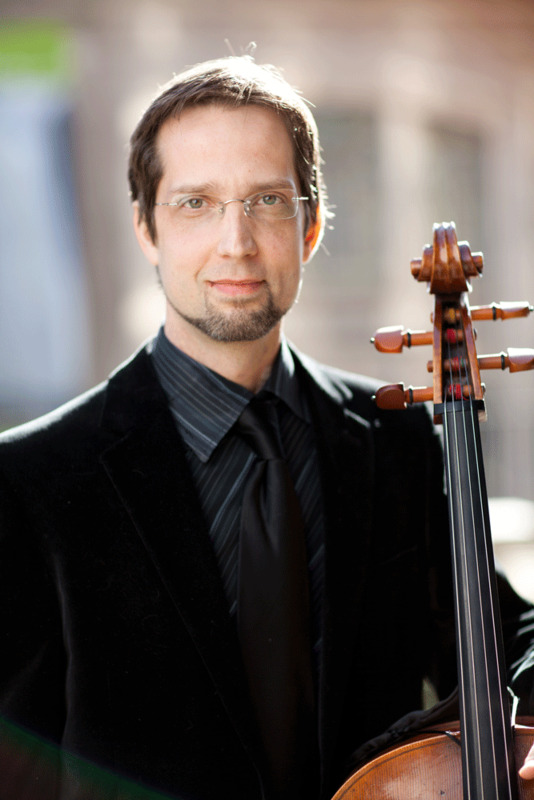 No private cello studio in the Northwest has won more awards in recent years. Dr. Krentz has been teaching at Seattle University since 2013 also. Kevin is very active as a recording studio session player in Seattle where he can be heard on many major films, as well as commercials, video games including Halo and Destiny, and CD’s from Dave Matthews Band to Evanescence. Kevin can also be heard as the solo cellist on the movie, Bordertown starring Jennifer Lopez and Antonio Banderas. Sought after for his ability to improvise his own parts, Kevin has lent his talents to countless other projects as well. He is the delighted father of Elena, 9 and Jesse, 8 and Katherine, 4.